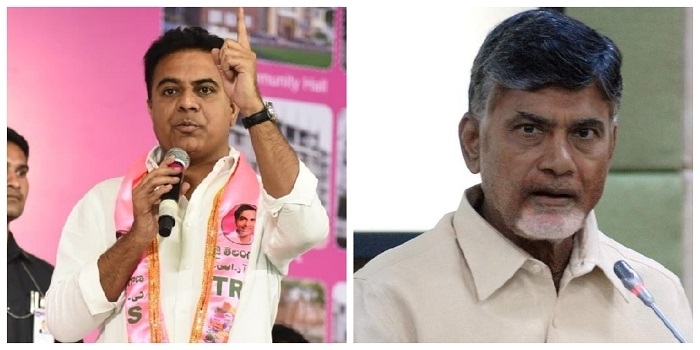 Hyderabad, Jan 23: Taking a pot-shot at Andhra Pradesh Chief Minister Nara Chandra Babu Naidu, Telangana Rashtra Samithi working President KT Rama Rao said that Naidu is just following the development policies and schemes adopted by the Telangana government. Addressing the small gathering here Rao said, “Naidu believes that by copying K. Chandrashekar Rao he would be able to retain the turf of Andhra Pradesh in upcoming Lok Sabha and assembly polls” He further added that people of Andhra Pradesh will expose the hollow claims of the TDP government. Responding to the issues faced by the journalist fraternity, the former IT Minister assured that the state government will take all possible steps to resolve the matter soon. On this occasion, in a lighter vein, Rama Rao asked media outlets to have a uniform approach while reporting. “Even after becoming a separate state, as compared to Andhra, Telangana is not getting enough eyeballs in the media circle” he observed.